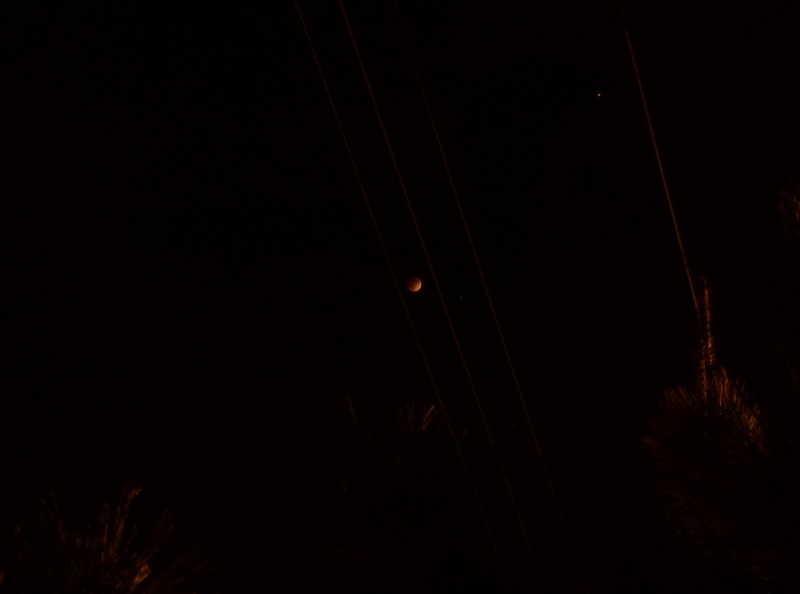 One of the nice things about a lunar eclipse is how accessible it is. You don’t need binoculars or a telescope (though it helps). You don’t need protective gear. You can see it from a city street with lights on. You don’t need to be in exactly the right spot to see it, since the viewing area is measured in multiple continents rather than a narrow track. And since it lasts longer than a solar eclipse, if the clouds roll in moments before totality (which they did), you can wait a few minutes and you might still be able to see something! The last time a lunar eclipse was visible in our area, I woke up at ridiculous-o’clock in the morning and went out to watch, first across the street, then trying to find a clear view in the west before sunrise and moonset drowned everything out. This time I just walked out into the front yard. Four stages of the eclipse. I’m not sure what the star next to the moon is. As Sam points out, the star is Spica. The phone line bisecting the second view looked interesting, so I went with that rather than an unobstructed shot. In retrospect, I should have tried to frame it to look like the Death Star trench. My son is almost 3 1/2 now, just old enough to appreciate this sort of thing, so I spent the last few days talking it up. We went out to look at the full moon early in the evening. We read a kids’ book on stargazing that he likes. I showed him pictures of what to expect, and diagrams showing how an eclipse happens. He’s been wanting to play with a tent ever since I mentioned the phrase “camping stuff” a few days ago, so we found the tent in the garage and set it up in the front yard. He had as much fun playing in the tent as he did watching the earth’s shadow move across the moon. Katie stayed inside most of the time and came out a few times to check on progress. At one point, an airplane flew across the sky leaving a sharp, bright contrail just next to Mars. We were all out just before totality around midnight…when a cloud started forming right in front of the moon. 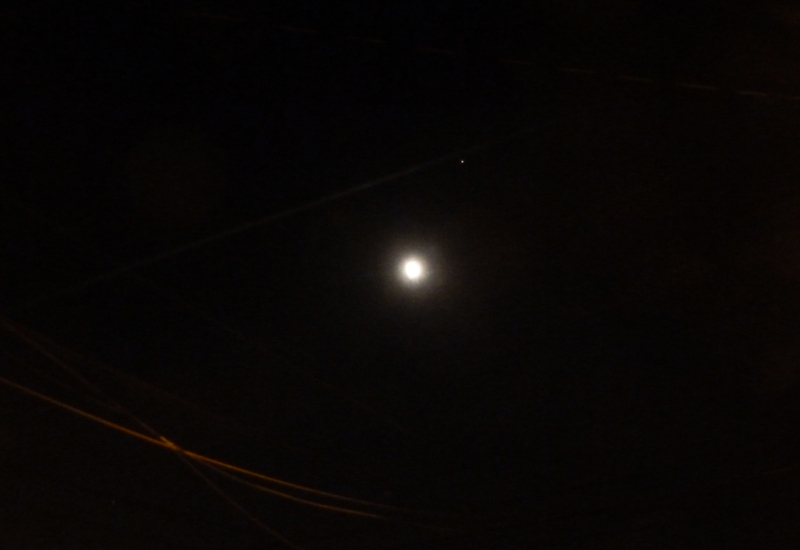 Mars, not too far away in the sky, was perfectly clear, but the moon got blurrier, and blurrier, until the razor-sharp sliver of a few minutes before was a blob of white. It reminded me of the time we saw about that much of an eclipse in San Simeon on the way up to (coincidentally) WonderCon when it was in San Francisco. 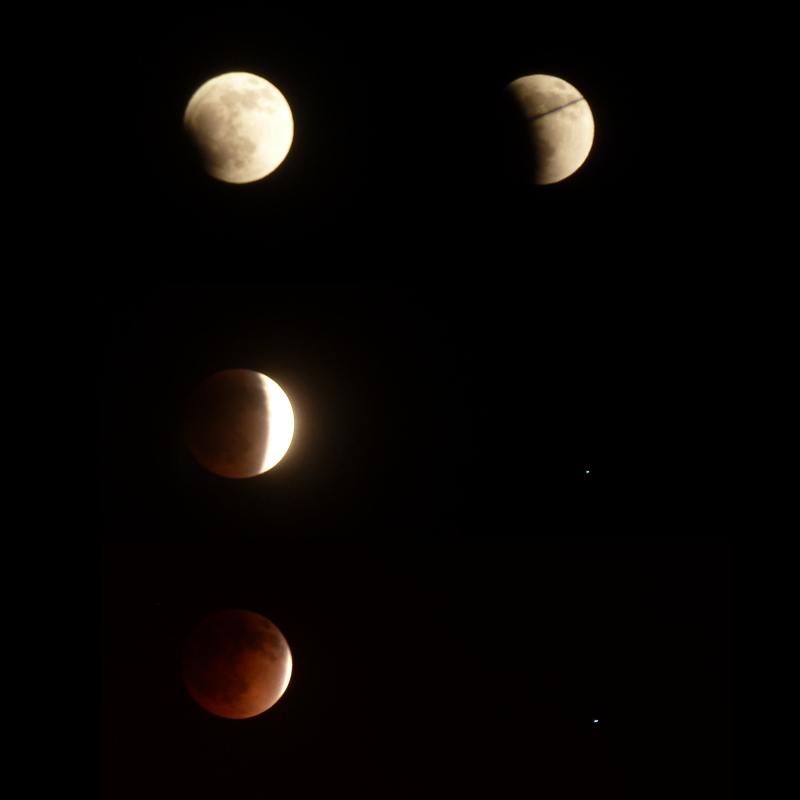 I should probably mention that while the pictures here look red, it looked brown to the naked eye. Maybe it was because the streetlight kept our eyes from adapting to the dark. Maybe the camera is more sensitive to red light. Katie remarked that without the sunlight shining on it, it really does look like what it is: a big ball of rock. After a few minutes we went back inside. Neither of us wanted to stay up until two to watch the same thing in reverse…or manage an increasingly tired and distracted three-year-old while doing so. This entry was posted in Highlights, Photos, Space and tagged astronomy, eclipse, lunar eclipse, moon, Stargazing on April 15, 2014 by Kelson. FYI… according to my Google Sky app, that bright star right next to the moon last night was Spica, the brightest star in Virgo. It was indeed! And thanks – I kept meaning to look it up, but it completely slipped my mind by the time I was done. Nice to see some photos — it was completely overcast and raining ice here (sigh), so I saw nothing 🙁 Glad you had a good view! Thanks! Sorry to hear about the weather up there.